The Emperor Lunar New Year film INTEGRITY (LIM JING FUNG WON YIN MOK) will open on February 5th, the Lunar New Year's Day. 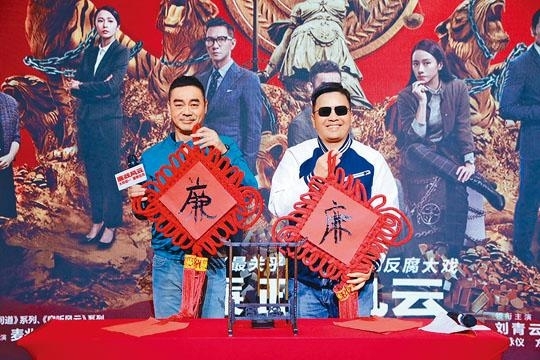 The Mainland promotional tour earlier split into two, as director Alan Mak Siu Fai and Best Actor Sean Lau Ching Wan reached Xiamen while Nick Cheung Ka Fai and Karena Lam Ka Yun appeared in Jiangmen. Director Mak Siu Fai landed in Xiamen with Best Actor Lau Ching Wan to the enthusiastic cheer of fans. They were excited as well as they personally gave away special edition gifts. In the end they also gave away couplets and wished fans an advanced Happy New Year. Ching Wan's fans successfully caught Ching Wan's eyes with the banner "ageless god Lau Ching Wan, give me glimpse if you can". Cheung Ka Fai and Lam Ka Yun's promotion was just as passionate as fans and onlookers filled the entire venue. On the stage they shared their production experience. Ka Yun mentioned that she personally performed the car stunt in Australia. Professional and calm throughout, she actually fooled everyone with her acting. After the cameras stopped rolling she was still out of it and needed tea to settle down.